We thought we might be spending this time writing about our troubles with the relentless heat or the difficult task of relieving yourself while at sea and stuck in a cockpit the size of a small coffin - and no we do not feel good about this analogy. However, despite all this, it is the idle chumps down at customs that are causing us the most grief. Of course customs was not open here either and we were duly informed that there is in fact only one customs officer for the whole island. So slightly disheartened that we would have to delay our crossing to St. Lucia for a day we headed on to the Richmond Vale Hiking and Diving Centre where we spent the evening with the kayak secured in their boat shed. Thank you Allison and Aaron for a fantastic stay! Using a poncho to collect water during a thunder storm. The next day we kayaked via Unon Island (a great place to clear in/out) to Canouan where we had to camp in the hillside jungle that lines most of the coastline. 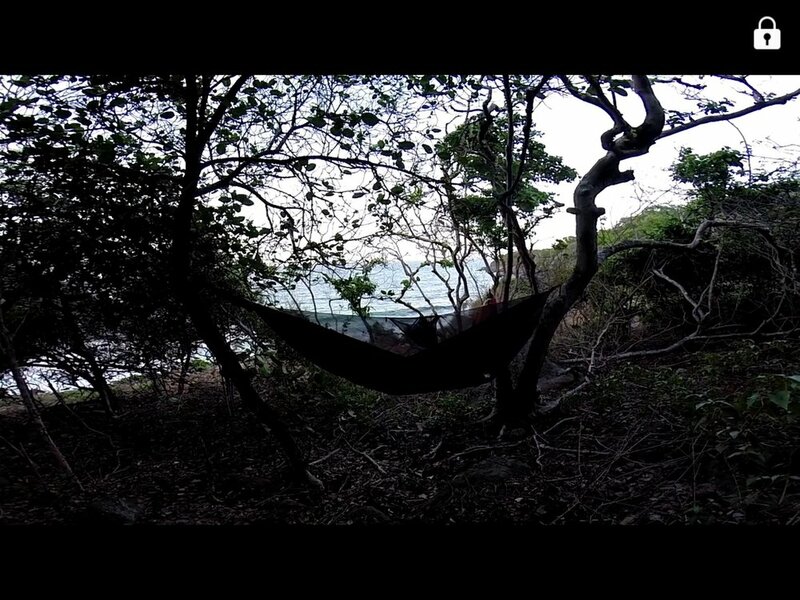 Here our Hennessy Hammocks came into their own and we quickly had them slung up looking out into the bay in an area where it would have been impossible to pitch the tent. Sorry for the poor photo.. we have had some technical difficulties which we are working on sorting out asap! Our longest crossing to date from Canouan to St Vincent brought some brilliant highs and some not so brilliant lows. See the mid-crossing update from Expedition HQ here. The favourable wind direction allowed us to release our (now not so secet) secret weapon, our 1.5m2 Falcon Sail. Suitably named Silly Sally after our friend and host in Grenada Sally Stalker. After making considerable progress for the first few miles we quickly realised that the sail, although giving us an extra knot or so, had drifted us rather dramatically to the West. We were heading for Mexico. A sharp change of bearing and a strenuous 10 mile paddle against wind and current brought us to the lovely island of Bequia. Using the mini sail.......... following in the James Hunt tradition, unapologetically in Wellington College colours. Dehydrated, hungry and tired we were treated to some conch fritas and coke from a kind gentleman, whose name has escaped us, sat at a local beach bar we entered hoping to fill up with water. An hour or so later and with renewed strength we were back on our way to St Vincent! All in all, including our not so fun detour, we paddled around 42 miles! So we are waiting now for the chance to clear out of St Vincent with the hope of edging further North this evening before embarking on our crossing to St. Lucia at first light. Hopefully our issues of linking go-pros and cameras to tablet will soon be resolved and we can upload some better photos and video clips! 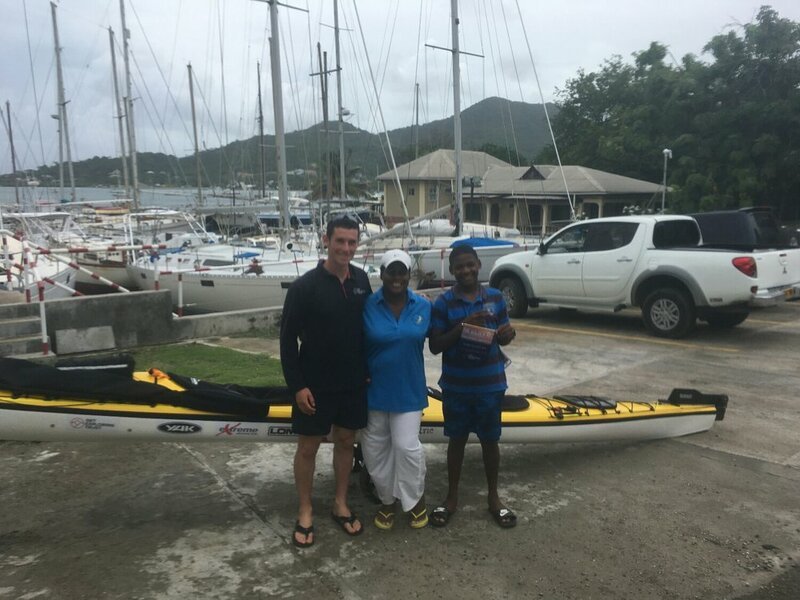 During the night the team paddled 15 km from Wallibou on the West coast of St Vincent to the North Eastern tip where they've been since about 2am. This start point will give them the best crack at the crossing to St Lucia across the St Vincent Passage. The problem here is a 2 knot East to West current which means they have to 'aim off,' a considerable distance to hit St Lucia. If they miss the island paddling back against the current will be a formidable task. The next land is Nicaragua some 2,600 km to the West. We understand that of the last four attempts to kayak the crossing only one has been successful. It is just about first light and they are about to set off. It's going to be a long day. You can follow them here.